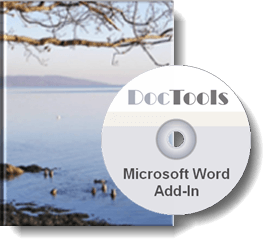 DocTools ExtractChanges Pro lets you extract ﻿﻿insertions, deletions and comments from any Word document, in full context and including headings and subheadings﻿﻿. The add-in reduces hours of work to seconds or a few minutes and makes the work with blacklining / redlining easier than ever. The add-in works with Word 2010, Word 2013, Word 2016, Word 2019, Word for Office 365 on PC. DocTools ExtractChanges Pro is the perfect time-saving tool for anyone who is editing large contracts, specifications and similar documents. Read on to learn how DocTools ExtractChanges Pro can help you. Single user license only EUR 197 - volume discount - see Pricing details below. I have literally compacted a full day’s work into about 1 minute and at the push of a button. DocTools ExtractChanges Pro is a must have tool for any front end transactional lawyer whose day-to-day life is ruled by track changes, blacklines and comments from their clients and counterparties. The program provides a systematic and high quality review of any document to create a standardized template at the click of one button - leaving a fee earner to push aside document compilation to focus on the key issues to be negotiated and formulate strategies to their clients. This Microsoft Word plugin, DocTools ExtractChanges Pro, is a lifesaver for anyone who is working with contracts based on a template. It will automatically do a batch-comparison of your final word documents (tip: we 'Star' the final documents in google drive, so we can quickly list them and download and extract these documents into a folder). On top of that, not only do you get a folder with the comparison results, the tool will give you a change report, only listing the changes, which is great if you are analyzing the typical changes to your template and if you are managing your contracts and need to have overview. It works from within your Microsoft Word, so the learning curve is almost non-existent. Finally, it is the only solution in the market that I know of that produces this result (other than expensive contract review software solutions). Highly recommended! To start the secure order process of 5.0 UPGRADE licence(s), click the UPGRADE button. The price will automatically be reduced to only 50% of the normal prices listed above. The user interface of DocTools ExtractChanges Pro is in English but the add-in can be used with any language version of Word. You will find more details about the DocTools ExtractChanges Pro features below. See also Overview of differences - DocTools ExtractChanges Pro and DocTools ExtractData. About the extracted heading data - which types of headings and subheadings will be detected? What are the differences between DocTools ExtractChanges Pro and DocTools ExtractData? On my website, www.thedoctools.com, I have provided a free macro for exporting / extracting tracked changes for years. The macro has been downloaded by thousands of Word users over the years. The free add-in, DocTools ExtractData, includes an improved version of the free macro. The free versions extract changes one by one without context whereas DocTools ExtractChanges Pro includes advanced functionality that extracts changes in full context and including heading and subheading information plus much more. I developed the first version of DocTools ExtractChanges Pro in 2012 to fulfill the wishes from clients. The add-in has been in use by large companies since then. Version 3.7 was the first version available from this website. See the Pricing and general information above for information about the current version number. Right-click any command on the DocTools ExtractChanges tab and select Add to Quick Access Toolbar (QAT) if you want easy access to the command no matter which tab in the Ribbon is selected. You can also select whether to show the QAT above or below​ the Ribbon. All you need to do to start the extract of changes from a Word document is to click the Extract Changes icon. Your current settings for viewing tracked changes are without importance for the extract process. The tracked changes may be shown or hidden. DocTools ExtractChanges Pro will find the changes no matter the settings. DocTools ExtractChanges Pro leaves the original document unchanged during the process. If you hover the mouse over a command, you will see a short description of the command. When you select a command that opens a dialog box, the dialog box will show information about what to do. In addition, the add-in comes with a User's Guide that provides tips about how you can handle special issues. The Extract Changes command will extract changes and comments from the active Word document. The tracked changes and metadata will be filled into a 9-column table in a new document. Only insertions, deletions and comments will be extracted. Any other type of change will be ignored. The Ext﻿ract Changes dialog box is shown at the bottom of this page. Paragraph Index number of the extracted paragraph in the source document. Heading data for easy reference, including up to 4 levels of headings and subheadings. The paragraph showing insertions and deletions as colored text - colors can be customized. Column for custom use. Any comments in the extracted paragraph will be inserted in this column. The column heading can be changed as desired. Column for custom use. The heading can be changed as desired. Column showing the authors(s) who made the changes/comments in question. This column can be automatically left out. Date(s) of changes/comments. This column can be automatically left out. Statistics information about insertions and deletions. This information may be useful for e.g. translators. The scope of each comment, i.e. the text that the comment refers to, will be marked by color shading in column 5 and an index number in superscript will be added just after the scope. The comment text in column 6 will start with [Comment #] where # is the same number as added after the scope. This makes it easy for you to find out where comments belong. In order for a paragraph to be considered a heading, DocTools ExtractChanges Pro will check for a number of other criteria in addition to the numbering. Otherwise, there would be a risk of interpreting many ordinary body text paragraphs as headings. For example, the text will be checked for relevant combinations of length, bold underlined, uppercase, centered, etc. In addition to the hundreds of variants of numbering syntax that will automatically be searched for, you can specify custom heading numbering to be searched for. The maximum number of heading levels that will be extracted is 4, i.e. levels 1-4. However, there may be situations where you want to leave out one or more levels in the extract document. For example, this may be the case in documents where built-in heading styles have been used for legal clauses or other types of content that is to be regarded as body text rather than headings/subheadings. An option in the Extract Changes dialog box lets you define how many heading levels to include, from 1 to 4. Example 1: Part of extract document. 4 levels of headings and subheadings have been extracted (marked by green). Example 2: Same part of extract document as in Example 1. Only 1 heading level has been included in the extract in this case (marked by green). While data is examined and changes extracted, a progress bar will be shown on the screen. The information will be updated continuously so you can follow the progress. You will also see extract data as it is being added to the extract document. The longer documents and the more changes, the longer time is needed for the process to finish. Often, the process will take less than 1 minute. DocTools ExtractChanges Pro can handle large document with many tracked changes and comments. The time it takes to extract changes and comments depend on the amount of paragraphs and the number of tracked changes and comments. Large documents with huge amounts of insertions, deletions and comments (e.g. +1000 changes and +300 comments) may, for example, take 10 minutes or more to process. Instead of extracting changes from the entire document in one operation in such cases, you may save time by using the Only selected content in main text story option and split the extraction in two or more parts. You can combine the tables from such extracts in a single document later if you wish. Note that Word 2016 and newer versions of Word are currently significantly slower than earlier versions of Word when it comes to execution of operations like extracting the changes. Microsoft is aware of the problem and is working on improvements. The look of the icons in the DocTools ExtractChanges tab vary depending of your version of Word and the selected Office Theme. 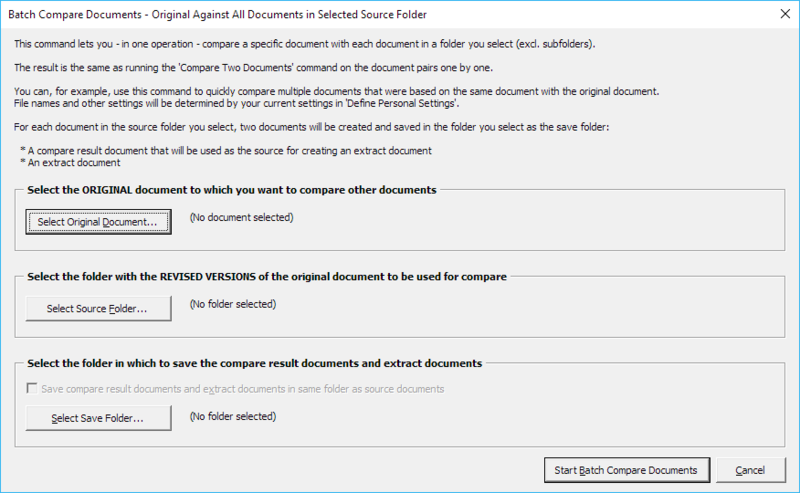 Lets you perform a compare of two versions of a document and extract the differences to a new document in one operation. Lets you – in one operation – extract changes from all documents in a folder you select (excl. subfolders). The result is the same as running the Extract Changes command on the documents one by one. The extract documents will automatically be saved in the folder you specify. Lets you - in one operation - compare a specific document with each document in a folder you select. The result is the same as running the Compare Two Documents command on the document pairs one by one. You can, for example, use this command to quickly compare multiple documents that were based on the same document with the original document. Deletes the “Author(s)” and “Date(s)” columns from the extract document, if found, and adjusts the widths of the remaining columns. The active document must be an extract document. Lets you point out the document that was used as the source document when you created the extract document. You can use this command if the source document has been moved and/or renamed. If the active document is an extract document, first click anywhere in the row that includes the extracted paragraph(s) you want to find in the source document. The command will then automatically open/activate the source document and select the paragraph based on the index number found in column 3 in the extract document. If the active document is a source document, the command lets you specify the index number of the paragraph you want to find. This is useful, for example, if a paragraph causes problems during the extract process due to poorly formatting or other reasons​. The progress bar dialog box will show the number of the paragraph where the process hangs. You can then stop the process and use Find Paragraph to go directly to that paragraph in order to fix the formatting problem. This makes it easy, for example, to use the Find Paragraph command in the extract document to select a specific paragraph in the source document if you need to check or edit that paragraph while you can still see the paragraph in the extract document. Built-in Word commands - also found on the View tab of the Ribbon. Added to give you easy access to the tools when viewing documents side by side. Lets you customize several options. See the illustration below. 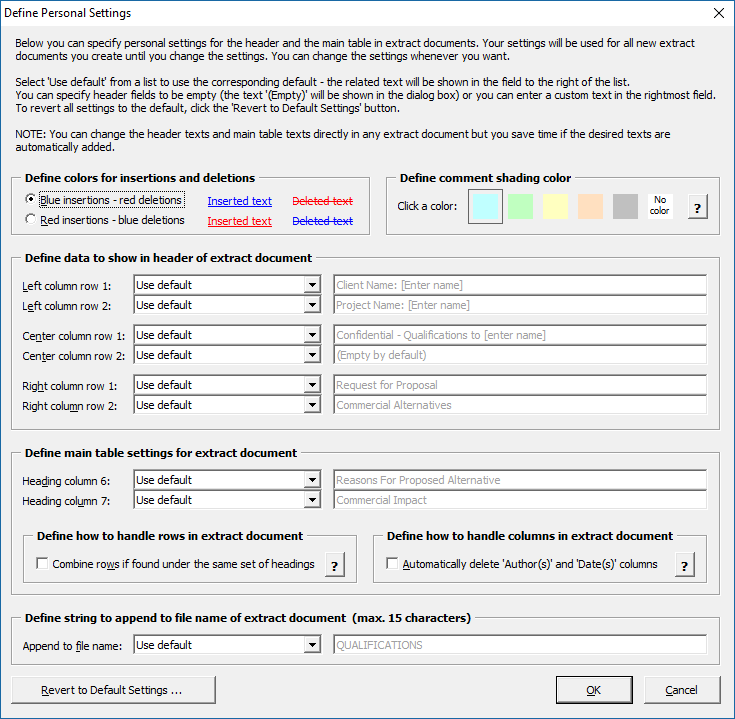 You can customize several options related to the extract documents via the Define Settings command. You can also define main table settings. For example, you can define whether or not to keep one row per extracted paragraph or to combine all rows for extracted paragraphs found under the same set of main heading/subheadings. When you click Extract Changes, you can select from different extract types and specify more customization options to be used for the current extract and/or for future extracts. 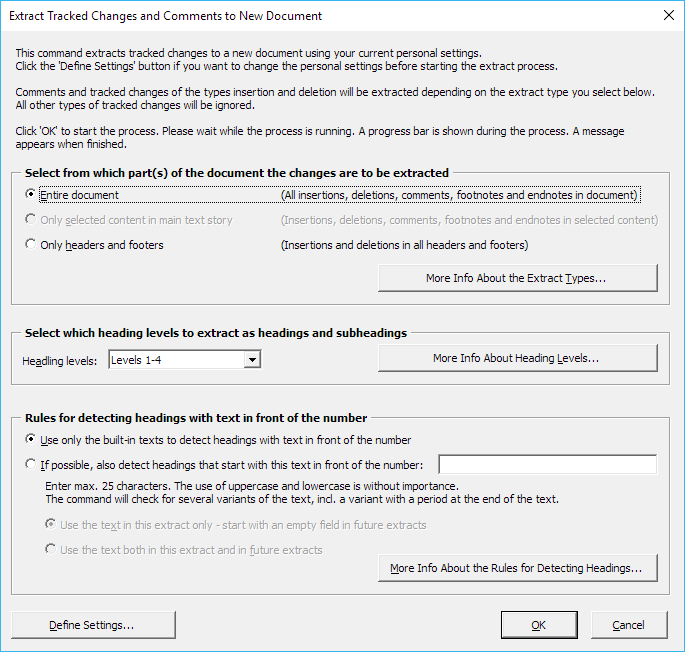 Note that the commands Compare Two Documents, Batch Extract Changes and Batch Compare Documents do not open this dialog box but automatically use the current default settings in the dialog box. When you click Compare Two Documents, you can select the document versions to compare either from a list of recent documents or by browsing. The author name besides the listed changes will be set to the name specified in File > Options > General tab in Word. When you click Batch Compare Documents, you can select the original document to which you want to compare other document, select the folder that contains the revised versions of the original document and the folder in which to save the compare result documents and extract documents. Information will be shown about the number of documents to handle in the source folder you selected.